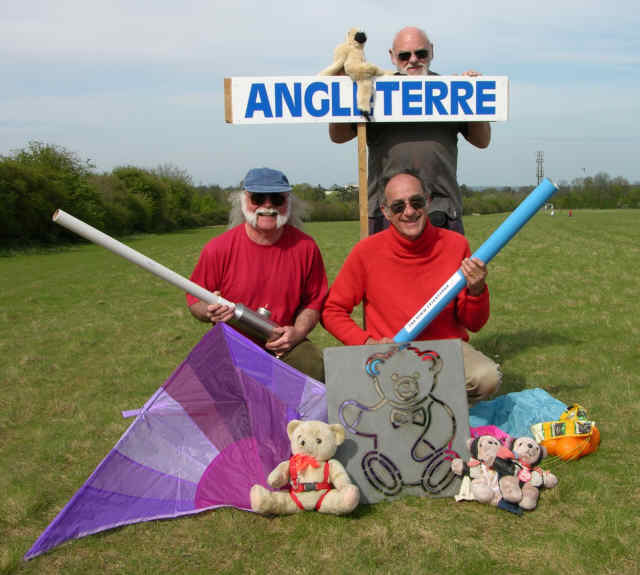 A Lovely Local (if you live nearby) Kite Festival - Echoes of Brenzett Mud. This is where real Grumpy Old Gits came into there own, putting on a great display of kites and teddy dropping under extreme conditions (are you listening John), including a very Hazardous kite rescue, I do hope Dennis appreciated the effort involved, I think it will take a week to recover from the athletic excesses involved, Thanks to Alan for holding on and Collin for the roach pole. Lovely country, lovely people, lovely kites, lovely food, lovely weather, lovely wine & beer. Can't wait for next year!!!! Would you trust these people with your Teddy Bear? Alan and Keith made kites + John annoyed.